The name Quby might not ring a bell for most people, but Toon probably does. 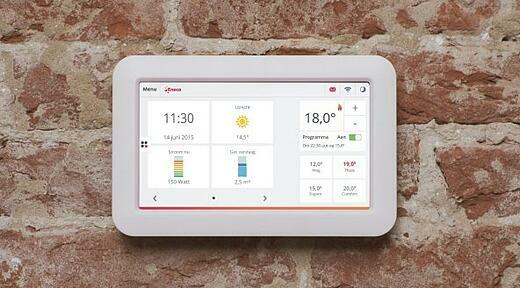 Toon is Eneco’s smart thermostat that provides very accurate insight into energy consumption. The smart meter was developed by Quby, a startup acquired by Eneco in 2015. In late 2015, Quby had 200,000 users and a target to scale up to one million in 2017. The goal required a highly stable and scalable platform and Quby asked Xebia to assist in developing it. Xebia focused primarily on building the platform and the test automation and monitoring components. The teams developed a continuous integration platform based on Docker, used by all developers and testers. The underlying idea is that all steps in software development, from idea through production, converge in a single platform. All code is open to everyone, allowing people to give feedback on each other’s work, and everyone can submit change requests. Xebia provided the technology used to run this platform and developed and implemented the associated processes. As part of this implementation, Xebia trained employees in a new mindset, a completely different way of working. Testing new software is now mostly automated. Docker contains all relevant test frameworks, so the tester indicates which tests to run, and it’s completed automatically, reducing the time required to test new software. Quby can continuously deliver new software, bringing it into production on a daily basis if required. Dashboards provide insight into the status of all platform components. If a component shows errors, a self-healing procedure is triggered. Xebia set up procedures ensuring that actions are triggered automatically. If any errors arise that cannot self-repair automatically, the right people are sent a message on their phones, telling them to take action. This work method minimized downtime noticeably for users. And if any downtime does occur, it is now resolved more quickly. The new work method means a pivotal change to both developers and testers working with Quby. They are working with a company developing cool technology, making use of the latest developments, like Internet of Things. Now the platform running Toon, the back-end, is also state-of-the-art. Using concepts such as continuous delivery and continuous integration, the newly developed software can be tested automatically and transferred to production immediately. Additionally, the teams are now fully agile and self-managing. With its new platform, Quby is ready to serve millions of new Toon users.